Medieval and Renaissance Historical Banners. 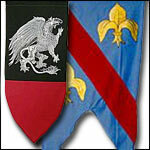 In our Banners and Flags Section we carry Medieval and Renaissance Banners that are very colorful. We also carry historical United States Flags as U.S. Civil War Flags. Our Medieval and Renaissance Banner Section has Bright and Colorful Four Foot Tall Silk Screened Banners that can be used to decorate home and hall as well as Medieval Weddings, Feasts and Fairs! Our Historical Medieval Banner section has Accurate Medieval Period Banners that are made in the traditional manner and will suit historical displays and reenactments. and We have the Celtic Dragon Banner, Rampant, Triple Lion, Jousting Banner, Knight, Castle, Trisele, Celtic Banner, Spanish Galleon, Mermaid, Welsh Dragon, Pegasus Banner, Wolf, Medieval, Crusader, Heraldic and the Grail Banner. Our large selection of banners and flags will satisfy the needs of LARP gamers and re-enactors. Come in and see our many flags.